On October 21, 2017 the witness saw a huge bright light over his house in Long Beach, California. At first he spotted two objects crossing paths with each other then focused on the larger one. As he zoomed in his camera the huge bright light started ejecting smaller spheres into the atmosphere. The first ejection formed a triangular formation. As he kept filming the object the object started emitting many spheres in a steady stream. There were at least 40 smaller spheres emitted from the main object. 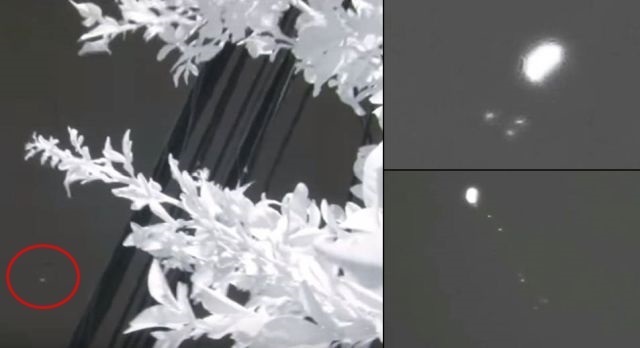 Interestingly the smaller spheres were only visible through his infrared camera. This was recorded with his full spectrum Canon SX60 with a monopod in his backyard in Long Beach CA. On December 30, 2017, once again a strange light has been spotted off the coast of Newport Beach, California. This time the light in the form of a ‘hexagon’ appeared for approximately 30 minutes during the very early morning hours. The first video shows the enhanced version of the November 21, 2017 sighting. Original video here. The second video shows the December 30, 2017 sighting including an analysis of both events.